Ever time the Horde retakes control of the Arathi Highlands, they are given an opportunity to claim Toys from fallen rares. This can only be done once per cycle however, so here in this article, you will find the location of each rare that drops a unique Toy. We are also providing you with a helpful route you could take for a quick and easy farming session. 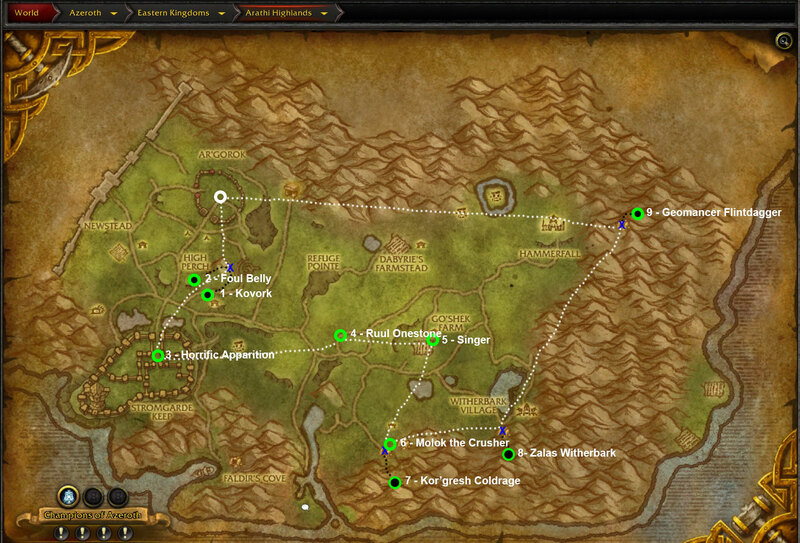 For our Alliance readers, you can find the location of your Toy dropping Rares over here. Take note of the blue X’s and the corresponding black centers of the rings. This indicates that the targets are underground, while the rest are found above ground. To reach these rares, simply access the entrance to their location found at the adjoining X. To reach this ugly brute, you simply need to enter the mine entrance found on the estern side of the hill adjacent to the Burning Goliath. He can be found in the main caven once you clear the tunnel. When defeated, there is a chance that he will drop a costume for you. Complete with its own emotes, such as dancing, the Kovork Costume turns you into a “mini” Kovork, for the duration of the effect. You can remain in costume, even while mounted, and during combat. This is the second rare ogre that can be found in the mine along with Kovork. He reside on the top ledge at the back of the mine. In order to reach him, there is a path to the right after entering the mine. He is heavily guarded by other ogres, but once he’s defeated you might get yourself Foulbelly’s Foul Belly. Think of it as a whoopy cushion. Found in the Alliance’s abandoned garrison, located to the south of the Hordes’s own garrison. This wandering spirit is surrounded by many other ghostly visages, and when it is defeated it may drop a Spectral Visage. This is a toy that renders both you and your mount translucent, with whiffs of ghostly smoke wafting around you. It is a similar look to how you would see yourself while you are stealthed, but others can still see you, albeit more difficultly. Yet another Ogre plaguing the Arathi Highlands. This shaman has a terrible habbit of bringing down meteors on his foes. Interrupt him or get out of the way, for the meteors will crush you. You might find yourself a Magic Fun Rock on his corpse. If you throw it to a friend, they will automatically throw it back to you, so long are they are able to. This peppermint kisses loving member of the Syndicate, can be found hiding inside the barn at Go’shek Farm. When you defeat her, you might be able to get hold of her Syndicate Mask, which can be worn over any existing helm you may be wearing. Wielding his large club, this ogre can be found outside the cave of his village. Watch out as he swings that club of his around and bring him down fast. On his body you might find your self a Molok Morion, a stone headwear depicting Molok himself. This magic wielding ogre resides deep withing his village’s cave. By defeating him you might find yourself a Coolrage’s Cooler, it enables you you summon a cloud that creates a light snow fall above you. Zalas enjoys the peace and quiet, and relaxing around a camp fire. We can ruin this for him when we find him deep inside his cave. By beating him up you might find the Witherbark Gong that he was trying to hide from his warriors. He had grown tired of the excessive banging and sort to keep it way from those who would disturb the peace. Too bad for him if we get our our hands on it then aye ;). This crafty little Kobold has found an ingenious use of a brazier… as a hat! You can find him hiding at the back of the cave by following the winding path to the right. When he is defeated, you might be able to salvage his Brazier Cap for your very own.